On officially opening the doors of the centre to the public in 1983, Minister for labour at the time Ruairi Quinn appealed for people from all parts of the North West to come together in a united effort to ensure that their skills can create jobs in the region. The aim of the centre was to provide a skilled and trained workforce for Irish Industry and to create a climate of self-reliance and innovation for individuals and communities who wish to start their own enterprises. The centre itself occupies an area of 5,000 square metres. The architects original brief were for a building to accommodate training workshops, classrooms, administration offices, canteen, stores and service rooms. The workshops themselves occupy some 50% of the floor area and their layout provided the key to the final design solution. They required a two –storey volume and were set in a rectangular unit with vehicle access on one side externally and trainee access on the other internally. Recent additions over the years include a new administration wing and a multi-purpose energy centre. 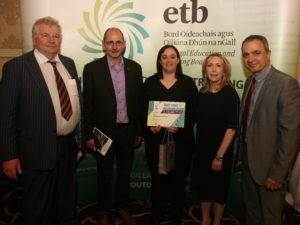 Donegal ETB Training Centres deliver an extensive range of training to a diverse range of clients including those entering the labour market for the first time, job changers, persons wishing to up-date or acquire new skills, those changing careers, persons with a disability and early school leavers. 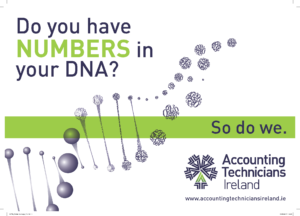 We offer a range of courses both in the centres and in outlying areas of Donegal in Information Technology, Business and Accounts, Hair and Beauty, Construction, Horticulture, Outdoor Activity, Engineering, Childcare, Healthcare, Catering, Software Development and Testing, and Social Media and Marketing. Day courses are designed to provide learners with a range of employment related skills and formal vocational qualifications to facilitate those entering the labour market for the first time and persons wishing to up-date or acquire new skills. Typically these courses can range in duration from 10-20 weeks. 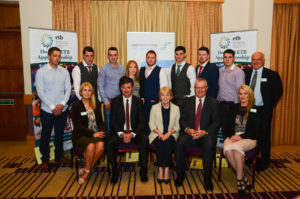 Traineeships are occupational specific and industry endorsed training programmes which combine Training Centres and on-the-job elements leading to QQI major awards mostly at levels 5 and 6 and/or industry recognised certification providing access to specific occupations in designated sectors. These programmes are targeted at occupations which are not designated as apprenticeships but entail significant skill requirements which are best acquired through a combination of alternating periods of in centre and employer based training. Apprenticeship is the recognised means by which people are trained to become craftspeople in Ireland. The apprenticeship system typically consists of 3 off-the-job phases and 4 on-the-job phases. Generally the duration of an apprenticeship is four years. For further information on becoming or employing an apprentice please contact the Services to Business Office in the Donegal ETB Training Centres @0749120500. The Construction Skills Certification Scheme (CSCS) provides for the training, assessment, certification and registration of non-craft operatives within the construction sector. Specialist Training Providers provide vocational training courses which target the needs of people with disabilities. They provide learner focused training and related services to individuals who require more intensive support than would be available in non-specialist training provision. STP courses are available in Letterkenny and Gweedore areas. Evening courses are generally delivered in the Donegal Training Centres along with outreach centres throughout Donegal 1 or 2 evenings a week. The majority of courses are generally between 5 to 15 weeks in Duration. Evening courses are open to all (both employed and unemployed), however fees will apply to those not in receipt of a payment from the Department of Social Protection. 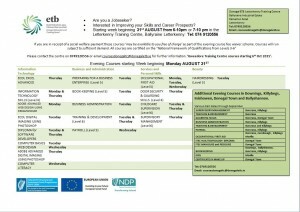 Fee paying clients must apply directly to the Donegal ETB Training Centres. Those in receipt of a payment from the Department of Social protection should apply through an Employment Services office. Would you like a career as a Surf Instructor & Beach Lifeguard?